We’re proud to announce the release of Aikido Journal Academy’s newest course – “Black Belt Essentials” with Patricia Hendricks. This is a very special project for us. Stanley Pranin, the founder of Aikido Journal, was Patricia Hendricks’ first aikido instructor, and she was there to help Stan print and assemble the very first issues of Aiki News. Patricia is deeply tied to our history. “Black Belt Essentials” is designed to be both a comprehensive technical reference and a beautiful showcase of the classical forms of aikido. We wanted it to be about both the art and the science of aikido. This course provides a reference model of what a shodan test might involve, but we view it more generally as a high-level overview of foundational empty-handed and weapons techniques. 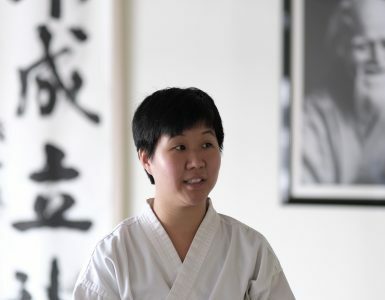 Patricia Hendricks is an exceptional aikido master who fuses fluid and elegant movement with immense power and stability. Her technique is about as close as you can get to the founder’s form. 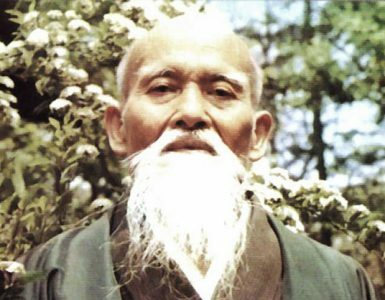 Over the course of production, I found a number of photos of Morihei Ueshiba in our archives shot from similar angles. The parallels are uncanny. 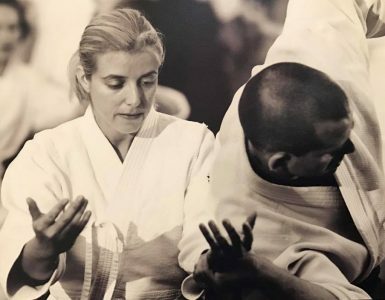 We couldn’t think of a better instructor to work with to produce the first instructional course in the 45 year history of Aikido Journal that features a female master. We hope you take a look at our newly released “Black Belt Essentials”. Will a DVD of the Black Belt Essentials be available to order in the future? Some of us are not Hi-Tech enough to figure out streaming yet (that’s me)? Greetings! Probably not. We have no plans for physical media at Aikido Journal. The demand is quite low for DVD based media and the production and logistics complexities associated with physical product distribution for media make it hard to justify putting any resources towards development of DVDs. Sorry 🙁 The streaming video version works just fine on any smartphone or computer with a web browser though and the UI is very easy to use.